Berlin offers its visitors and residents a huge range of outdoor and indoor sport opportunities, whether you are looking for a mainstream activity or something more specific. The popularity of some sports also changes during the year. As most lakes freeze during winter, ice skating is more popular in winter, whereas in summer all Berliners pilgrimage to the local lakes. To give you a good introduction to the sport opportunities in Berlin, we’ve created this awesome Top 10 list of sport activities that you must try at least once, when you live in Berlin. Football is by far the most popular sport in Berlin. Although Berlin’s first football team has not achieved any notable results lately, Berliners still enjoy their national sport. Many companies have their own football teams and there are dozens of leagues for amateurs, advanced players and professional football players. To catch a team in action as a new Berliner, the easiest way would be to join the various football groups on Facebook. Such groups are administered by the local teams and you can simply ask when and where to join them! Berlin is one of the best places in the world to have a run and burn some calories; hardly any other capital has as many grass areas as Berlin and the roads are broad enough to enjoy your run without a scramble. It is no coincidence that the annual Berlin Marathon is one of the fastest and most popular marathons in the world. Both parks are ideal for your workout between trees and picknickers. If, on the other hand, you prefer running on asphalt, the former airbase Flugfeld Tempelhof is the place to go. Table tennis is one sport that is very common in Berlin. In almost every park (and Berlin has a lot of parks) you can find at least one table to play table tennis. If you have your own racket, you can easily join a group of people in a match – it’s a great sport for getting to know new people. Even in bars you can play table tennis; usually you can borrow a racket while ordering your beer! One of the coolest bars where you can play table tennis is Dr. Pong. Martial Arts, whether with an Asian or a Western influence, are quite popular in Germany. Whereas Hamburg is known as the capital of boxing in Germany, several other excellent gyms offer a wide range of styles in Berlin. If you are fed up with monotonous fitness center routines, we recommend you try some kickboxing or judo, where besides learning some useful self-defense techniques, you can develop your strength and do some cardio. The most popular martial arts gyms are the famous Kickboxing Gym Golden Glory, and the first ever Judo club in Berlin, Ebjc. Both of them also have English speaking trainers so don’t be shy. Even though Berlin is not located near the sea, there are some cool beach volleyball courts in the city. Especially in the summer months, from May to August, these sand beaches are popular with people who fancy playing volleyball on the sand. Often there are some beach bars beside the fields where you can enjoy a nice drink after a good round of sports. The most popular spot is Beach Berlin, located right next to the central station. Berlin is the perfect place to go if you enjoy swimming in a natural environment. Apart from the various rivers (attention: you can’t swim in all of them! ), there are dozens of small and large lakes you can easily get to with public transport. The most popular is probably Wannsee, which has a 1.2km long beach area. Other popular lakes where you can have a swim are the Großer Müggelsee, in southeast Berlin, or Plötzensee, centrally located in Wedding. For many people, the regular gym session is as important as the visit to the hairdresser. Depending on your budget, the gyms in Berlin offer much more than treadmills and weights. From indoor pools to steam saunas and free drinks, the different studios offer extras for all budget ranges. Another factor that should not be underestimated is whether your gym is close to your home or office. Using public transport, getting from A to B, can cost you valuable time which you surely want to invest in other leisure activities rather than sitting in the bus or tube. For those who live on a strict budget and really don’t need more than standard gym equipment, McFit might be the best option: monthly membership costs €20 and there are 21 gyms all over town. For those who don’t need to count pennies, perhaps a better choice is Fitness First: a chain with 17 studios in Berlin (some of them exclusively for women), many of them including wellness areas like pools and saunas. A membership at Fitness First starts at €40 and moves up from there. One very fun sport activity during winter is ice skating. Those of you who come from warmer countries will especially enjoy this cool winter sport. Effectively, ice skating is like a faster version of rollerblading, which, by the way, is also very popular among the visitors of the Tempelhofer Feld. Usually ice skating can be done on special ice tracks that are open between November and March. Even a couple of lakes in Berlin are used as ice tracks once they are frozen in winter! Don’t worry about the ice skating shoes, you can simply rent them for a few euros – the operators lend shoes in all different sizes. One of the bigger tracks can be found on Müggelsee, but also popular is the small ice track at the Christmas fair at Alexanderplatz. 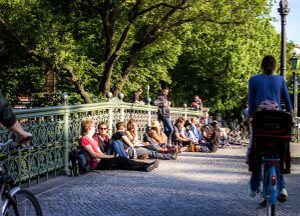 One of the reasons why so many people love Berlin is the amount of parks and broad streets that can be found all over the city. Even though the city has more than 3.5 million inhabitants, you never feel hemmed in like in other capitals. To be honest, Berlin is nothing compared to Amsterdam when it comes to bike friendliness, but still, many roads and routes along the rivers and lakes are inviting for long bike tours. In case the weather doesn’t play along during one of your trips, you can simply take your bike with you into public transport. However, an additional ticket needs to be bought for that – currently it costs €1.70 for one way. City life can be stressful sometimes. What better way could there be to calm down than doing yoga? Due to increasing popularity, there is a yoga studio on almost every corner – very good if you don’t have flexible working hours, as you are sure to find a studio that suits your timetable. Whether you want to learn Jivamukti Yoga, Anusara Yoga or Tao Yoga, everything can be found in Berlin – just check Google Maps for your local studio. Every Yogi/Football player/Boxer needs a break from sports sometimes. But what to do in your spare time? Do not wonder no more we have lot’s of ideas for you. 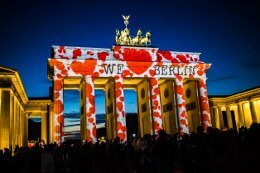 If you are looking for some ideas of what to eat in Berlin or what to do in Berlin continue reading.